Sony engineer Norio Ohga – widely regarded as pioneering the Compact Disc format – has passed away. The invention of the CD arguably saved the music industry. Under threat from home taping, record labels struggled to find a way to reinvigorate their back catalogues and inject investment into new talent. Pioneered by Sony, the CD sent sales to, if you excuse the pun, record levels. Famously billed as being virtually indestructible – can you really smear jam on them? – the CD soon became the primary means of listening to music. Sony engineer Norio Ohga led this change. 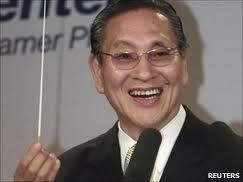 President of the Japanese company from 1982 to 1995, Ohga actually began life as an ambitious young opera singer. Drawn into the world of engineering, Norio Ogha soon focussed this ambition on new technology. When discussions about the possibility of the compact disc began, it was Ogha who insisted that the CD should be 12 cm in diameter – enough to safely carry Beethoven’s Ninth Symphony. Later, Norio Ogha would preside over the purchase of the Columbia label and also launched Sony’s games division – who would in turn produce the Playstation. This was probably the first BIG Compact Disc in terms or worldwide sales.